War stories take us back to a place where truth, honour, loyalty and courage all come into play in a grand chess game orchestrated by paper architects who never have to face the firing line. As a result, the stories and indeed the histories, that are handed down are often constructed to tell a particular narrative that favours a particular ‘telling’ of a story. But author Anita Heiss has proved that histories can be re-told. Barbed Wire and Cherry Blossoms is one such example. A tender and slowly unfurling love story it is set against the political hijinks of the final years of the Second World War. Mary Williams is a young Wiradjuri woman and her family, along with a number of other locals on the mission, have decided to safeguard a Japanese prisoner-of-war who has escaped the compound. It is 1944 and over a 1000 Japanese soldiers were reported to have broken out. Rather than face the shame and humiliation of defeat these men were willing to risk their lives. Hundreds were killed and many recaptured in the ensuing bloodbath but one man escaped. Hiroshi, desperate to live, finds himself protected by the local Aboriginal community and is overwhelmed by their kindness and compassion – especially considering this is a time when Indigenous Australians are not even recognised as citizens in their own country and are denied basic human rights – including rights that even the Japanese and Italian prisoners-of-war are given such as regular meals and access to running water and electricity. 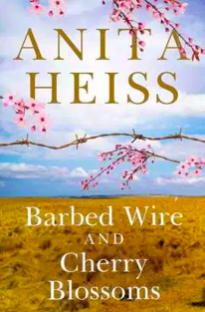 Heiss has a flair for creating poignant narratives and they’re laced with humour, wit and a biting realism that reminds us that it’s not just the story but who tells the story and how that story is told that is equally important. Australia in 1944 is a country that is enmeshed in multiple wars on the European and Pacific front but it is also at war against its own people. A backdrop of turmoil, fear, ignorance and resentment there is still hope for the love of two young people caught in the brambles of war to dare to hope for a future together. The question is not whether love can cross boundaries of geography or culture (there has been centuries of evidence that yes, it can) but Barbed Wire and Cherry Blossoms asks a different question: are we ready to embrace the fact that there are so many alternate histories just waiting to be shared? This is one of those histories. In fact, it’s his story as much as her story and together it is their voices that Heiss brings forth in an enduring story of young love.